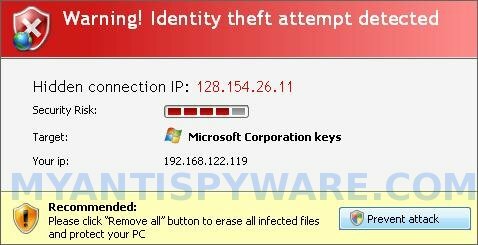 Security Master AV is not a legitimate security tool, it is a malicious program that classified as rogue antispyware because it detects false infections and displays a lot of fake security alerts in order to trick your into purchasing the software. Security Master AV from the same series of malware as early appeared My Security Engine and Security Guard. The difference between this new rogue of others very slightly. Firstly, changed the name of the program and secondly, have been partially modified the core component of the program in order to protect it from detection by the legitimate antivirus and antispyware tools. Otherwise, everything remained as before. Security Master AV distributed usually through fake online malware scanners. The web scanner imitates a system scan and once finished will claim to have found trojans, viruses and malware. It will advise you to download and install an “antivirus”. 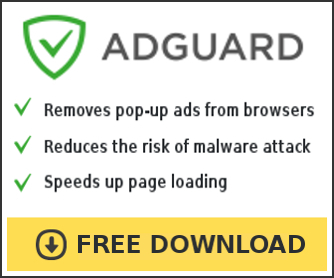 This “antivirus” is a trojan, that once started, will download and install Security Master AV onto your computer. During installation, Security Master AV first step will register itself in the Windows registry to run automatically when Windows starts, then add a few entries into HOSTS file so that when you open Google, Yahoo or Bing, you will be redirected to various misleading websites. The same trojan that installs the rogue will also create several fake malware files, that absolute harmless, but later during the scan, Security Master AV will report them as worms, trojans and viruses. Of course, this is a scam. Like other rogue antispyware applications, the rogue want to force you to believe that your computer is infected. Important to know, Security Master AV is unable to detect or remove any infections and nor will be protect you from legitimate future threats. So you can safely ignore the false scan results. 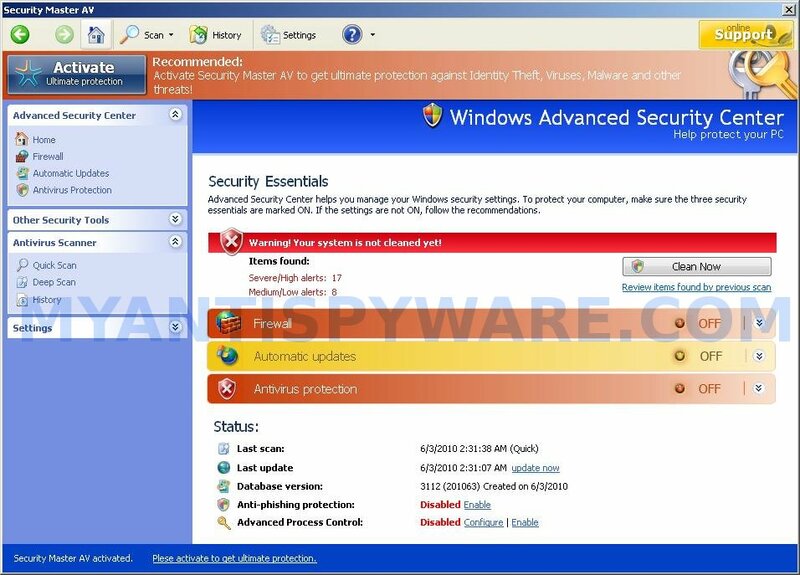 Security Master AV to remove all found threats immediately. remove them using Security Master AV. immediately using Security Master AV. From the above, obviously, Security Master AV is a scam, that created with one purpose to scare your into purchasing so-called “full” version of the program. Most importantly, do not purchase it! Instead, use the removal instructions below to remove Security Master AV and any associated malware from your computer for free. Step 1. Remove Security Master AV and any associated malware. Make sure the “Perform quick scan” option is selected and then click on the Scan button to start scanning your computer for Security Master AV infection. This procedure can take some time, so please be patient. Make sure all entries have a checkmark at their far left and click “Remove Selected” button to remove Security Master AV. MalwareBytes Anti-malware will now remove all of associated Security Master AV files and registry keys and add them to the programs’ quarantine. When MalwareBytes Anti-malware has finished removing the infection, a log will open in Notepad and you may be prompted to Restart. Hey Patrik. Same problem, I applied both SELECT * From FirewallProduct and SELECT * From AntiVirusProduct this time, clicked Delete Property for displayName CIM_STRING Security Master AV then closed out of the Windows Management Instrumentation Tester. I opened my Control Panel, Security Center, Security Master AV remains still. Are there other properties associated with Security Master AV that do not specifically have the name, Security Master AV, in it? Did I exit the Windows Management Instrumentation Tester incorrectly? Looks like rubyg and I are dealing with the same issue. Rachel, probably your PC is still infected. Open a new topic in our Spyware rempoval forum. I will check your PC.